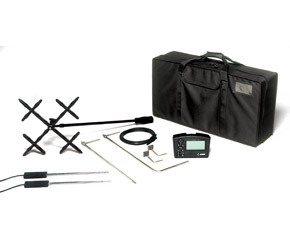 The Alnor Micromanometer EBT730 is one of the most advanced, versatile, and easy to use micromanometers on the market today. The EBT730 features an auto-zeroing pressure sensor that increases measurement resolution and accuracy along with an intuitive menu structure for ease of operation. Available only in North America. Please see the TSI DP-Calc 8715 for availabilty outside of North America. Image shown features standard and optional accessories.